if only she can figure out what it wants. 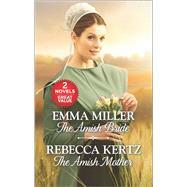 Amish widow Lizzie Fisher loves her seven stepchildren but worries that brother-in-law and heir to the farm Zachariah Fisher will send her away. Lizzie's determined to prove she's a hard worker and a loving mother. Soon she's falling for the handsome farmer and hopes he'll see they're meant to be a family forever.